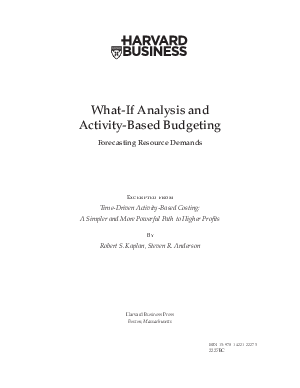 Activity-Based budgeting does not solve all the problems associated with budgeting, but it will improve the line-item budgeting processes. It will allow for a more analytic approach for deciding on the quantity of resources that need to be supplied to meet future periods’ forecasts of production and sales. By downloading this whitepaper, you will learn how to build a successful what-if or activity-based budget in 6 simple steps and allow greater spending control over your organization’s cost structure.